If you’re making plans to visit the Walt Disney World Resort this holiday season you’ll want to check out the latest e-book from our friends at the Disney Food Blog. 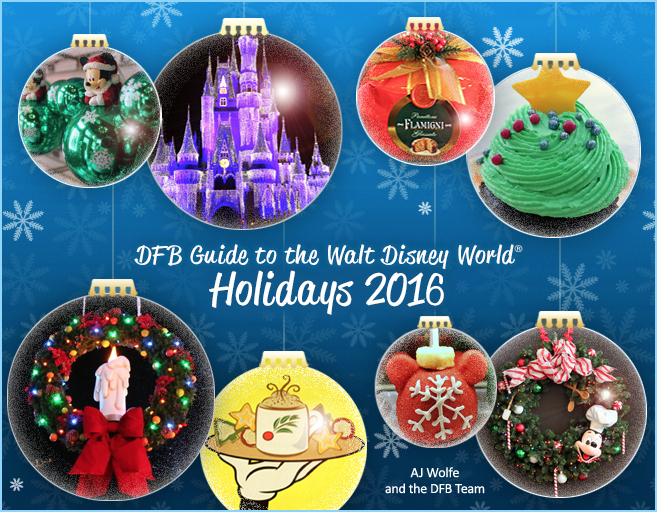 The all-new DFB Guide to the Walt Disney World Holidays 2016 e-book was recently published and it features everything you need to know about celebrating the holiday season at Disney World. The instantly downloadable e-book features more than 380 pages of information, more than 350 full color photos, and much more. The guide also includes: full schedules of events for November, December, and January; details and descriptions of every holiday event at the Walt Disney World Resort; a comprehensive holiday dining section; an expanded Epcot Holidays Around the World section; scavenger hunts; food and drink crawls; and much more. Readers will also find customizable touring strategies, holiday activities and events for kids, and an expanded FAQ section. To celebrate the launch of the DFB Guide to the Walt Disney World Holidays 2016, the DFB is offering the book with a 20 percent discount off the cover price. Just use the code CANDYCANE at checkout to receive the discount. This entry was posted on Saturday, November 12th, 2016 at 9:00 am	and is filed under Dining, Hotels, How To, Planning, Theme Parks, Tickets, Touring Plans. You can follow any responses to this entry through the RSS 2.0 feed. You can leave a response, or trackback from your own site.